Thanks to the Comte de Buffon’s comprehensive Natural History, every European in the eighteenth century knew that the American environment was conducive only to degeneration. Still, Buffon admitted, “though Nature has reduced all the quadropeds of the new world, yet she has preferred the size of reptiles, and enlarged that of insects.” As his Dutch colleague Cornelis de Pauw put it, giant insects and venomous snakes “so unhappily distinguish this hemisphere” from the more hospitable side of the Atlantic. Leaving aside insects for the moment, reptiles—and especially serpents—have always had a powerful symbolic valence. In the American context, the ambivalent use of the reptile shows up some of the complex relationship between the colonists’ natural world and their political imagination. Like so many things, the rattlesnake as an icon of America originated with the mind and pen of Ben Franklin. In a modest proposal of 1751, he suggested that if British felons were to be transported to the colonies, a fair exchange might be made with American rattlesnakes—”Felons-convict from the Beginning of the World.” If nothing else, “familiarity with these Reptiles” would teach British nobility “to creep, and to insinuate, and to slaver, and to wriggle into Place (and perhaps to poison such as stand in their Way) Qualities of no small Advantage to Courtiers!” Three years later, Franklin published his “Join, or Die” woodcut, in which the snake became a symbol of the colonies themselves. Against his better judgement, Franklin’s image became a banner of the Stamp Act protests; by 1775, in the Gadsden Flag, the rattlesnake had undertaken a transformation from creeping convict to noble, if venomous, symbol of the revolutionary states. Snakes were dangerous, no doubt about that. They would defend themselves when provoked. But, as Franklin had pointed out, rattlesnakes at least had the honor to give a warning before striking. Gouverneur Morris employed the serpent metaphor in a letter of 1774 that has since become well known. “The mob begin to think and to reason,” he wrote. “Poor reptiles! it is with them a vernal morning; they are struggling to cast off their winter’s slough, they bask in the sunshine, and ere noon they will bite, depend upon it.” Though it’s often wheeled out as no more than a slur, Morris’ point relied on a specific set of reptilian characteristics. In his mid-century Natural History of Carolina, Mark Catesby had declared the rattlesnake “the most inactive and slow moving snake of all others,” and also “the most deadly venomous” in America. For Morris, both these aspects were relevant to the metaphor. Popular consciousness was slow to act, but powerful when it did. Though they were “poor” reptiles, Morris’ mob were not treacherous, creeping, or sneaky: they were a threat to be watched and feared. Other observers, however, did play on the snake’s reputation for low cunning. In 1782, the British cartoonist James Gillray accepted the iconography of Gadsden’s flag by depicting the rebel colonies in the form of a serpent. 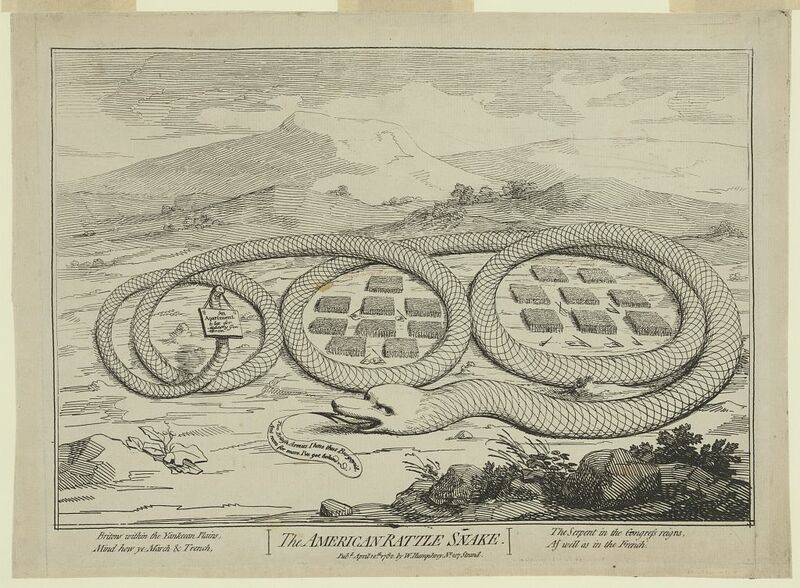 With its coils draped around two armies—those captured at Saratoga and at Yorktown—the American snake boasts, “Two British armies I have thus Burgoyn’d, and room for more I’ve got behind.” On her tail hangs the sign, “An apartment to let for military gentlemen.” Here, it’s more than just the venomous power of the serpent that is being remarked, but its trickery too. America was a trap that would only lure more British armies to their doom. Continuing the war, Gillray implied, was a fool’s errand. Quoted in Lee Alan Dugatkin, Mr Jefferson and the Giant Moose: Natural History in Early America (Chicago: University of Chicago Press, 2009), 24, 102. [Benjamin Franklin], Pennsylvania Gazette, May 9, 1751. Only months before the victory at Yorktown, George Washington used his own reptilian reference to express the desperate situation of his Continental troops. Supplies were so low, he told Gouverneur Morris, that “it would be well for the troops, if like chameleons, they could live upon air.” (George Washington to Gouverneur Morris, December 10, 1780). Of course, Thomas Browne had long disproved the myth that chameleons need no food; but the image still carried a bitter poignancy for Washington. An American Guesser [Benjamin Franklin], Pennsylvania Journal, December 27, 1775. Your timing was perfect! I taught the Albany Plan and Benjamin Franklin’s Join or Die poster in my class this morning.